If you’re walking to catch a bus, go shopping, or get to school, Denver’s golf courses can make you feel like a second-class citizen. That’s because the streets abutting golf courses are often missing sidewalks — so you end up walking on a makeshift dirt path in between manicured greens and high-speed traffic. 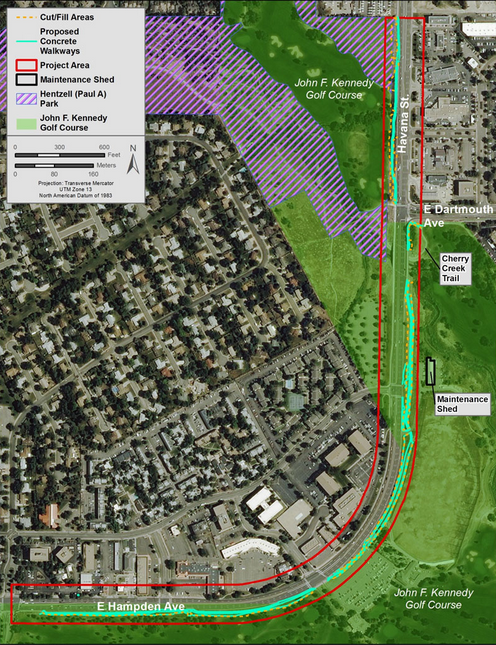 At John F. Kennedy Golf Course in southeast Denver, that’s about to change. 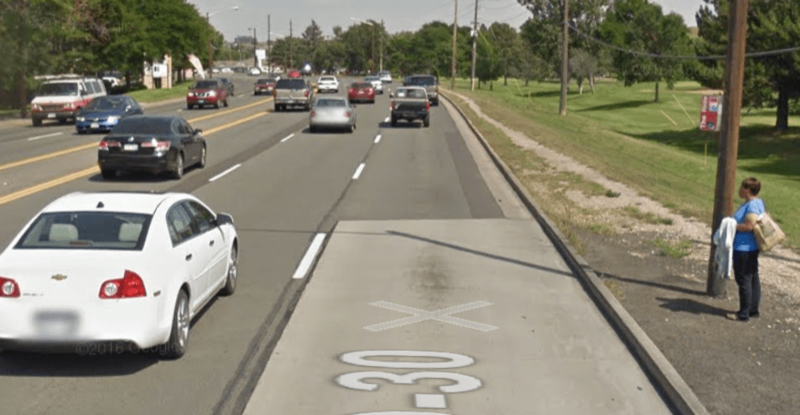 Denver Public Works and the Colorado Department of Transportation will build sidewalks on East Havana and South Hampden streets (aka CO-30, a state highway) between South Dayton Street and a little north of East Cornell Avenue. The project is along a five-lane, 45 mph road and includes a 20-foot-wide path for bicyclists and pedestrians that connects to the nearby Cherry Creek Trail. The new sidewalks will fill a 1.2-mile gap in the city’s pedestrian network, helping people walking to and from Shoemaker Elementary School, Hentzel Park, and local shopping centers. Pedestrian connections to two nearby RTD light rail stations, Dayton and Nine Mile, both of which are on the H-Line, will improve as well. Nine Mile Station will also be a stop on the R-Line when it opens this winter. Colorado DOT is covering most of the cost, which comes to a little over $2 million, with a federal grant. The sidewalks will be complete within the next five months, according to the contract. Hampden Ave from Monaco to Tamarac Dr. would be ideal for BRT or enhanced bus route service.